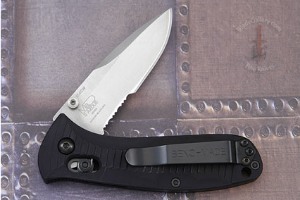 Blade height (at heel): 0.92 in. 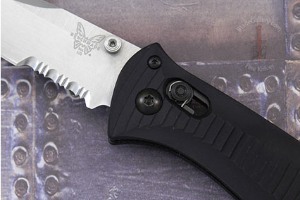 Description: Designed by Mel Pardue, Benchmade's Mini-Presideo belongs to their Professional Black Class. Knives in this class are engineered to work first time, every time. All the right designs, materials and technologies combined to become the right tools for the job. Benchmade chose their materials for strength and corrosion resistance. 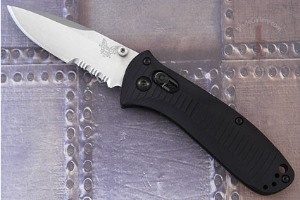 The black anodized aluminum handle is light weight but super sturdy. The handle was machined for a multi-directional positive grip. 0.1396484375 0.1396484375 139.6484375 139.6484375 Header Started. 0.4677734375 0.0458984375 467.7734375 45.8984375 Trailer Started. 0.5927734375 0.125 592.7734375 125 Trailer Completed.